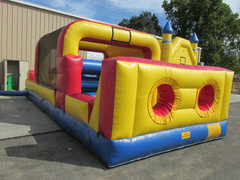 Our obstacle courses will bring out the competitive out in anyone! Austin Metro Moonwalks has the perfect option for your backyard event, or even school, church or park event. This is a great option for your business when having an event as well. It will definitely attract kids and adults alike.